Like other mothers, female chickens (hens) are known to be protective of their young. However, researchers have gained new insight into the minds of domesticated hens, indicating, for the first time, that they show signs of empathy for their baby chicks. In a non-invasive experiment, researchers at the University of Bristol’s Animal Welfare and Behaviour research group in the School of Veterinary Sciences found that domesticated hens show a clear physiological and behavioural response when their chicks are mildly distressed. During a controlled procedure, when their chicks were exposed to a puff of air, the hens’ heart rate increased and eye temperature decreased. The hens also changed their behaviour, and reacted with increased alertness, decreased preening and increased vocalisations directed to their chicks. Some of these responses have previously been used as indicators of an emotional response in animals. 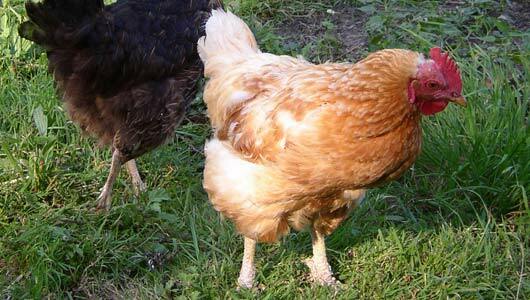 In domesticated chickens, time spent standing alert is associated with higher levels of fear. Previous research has shown that hens also selectively avoid surroundings associated with high levels of standing and low levels of preening. The researchers chose to use chickens in the experiment because, under commercial conditions, chickens will regularly encounter other chickens showing signs of pain or distress due to routine husbandry practices or because of the high levels of conditions such as bone fractures or leg disorders. Findings such as this have clear implications for the ways that we currently farm and kill the animals that some people choose to eat. Edgar J. L, Lowe J, Nicol C. J and Paul E. S 2011 Avian maternal response to chick distress. Proceedings of the Royal Society B.